Compact (1/3 of 19’’) and very easy to use, µScoop is a cost effective IP codec that allows you to easily and efficiently perform IP connections over wired networks (Ethernet). 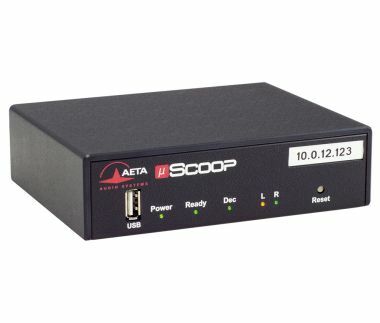 Coming in analog or digital version, µScoop integrates AETA’s expertise to meet professional broadcasting requirements: wide range of coding algorithms including OPUS and MPEG Layer 2, free factory SIP account (exclusive for the device on AETA SIP server) and interoperability. The device can be configured and controlled easily from its embedded HTML server, accessible on LAN, or remotely thanks to the Remote Acces option. It is also possible to control µScoop via codec management software, such as Scoop Manager. Aimed at broadcasters for outsourced contribution, µScoop is also suitable for all cases of long-distance AoIP communications with professional quality requirements (Sound system/Events).